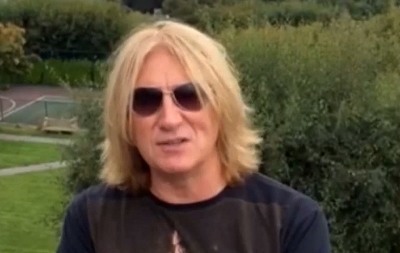 Def Leppard singer Joe Elliott has been interviewed by New Jersey radio and mentioned the new album. Joe talked about David Bowie's recent death, 2016 tour dates, the setlist and the new album. Listen to the full 8 minute interview via the link below. "Awful. Absolutely awful. It was like losing a family member. You know it was - it's hard to put it into words because it is a strange one. You know I mean he's not family. So people are easily gonna say well how can you feel so emotional about somebody you don't know that well. But as we all know music's not like that. That's why there was candle lit you know how many thousands of people were in Central Park when Lennon died. Music touches people and I'm no different to anybody else. Bowie's been in my life for 44 years and I don't think there's been a day gone by that I've never played one of his songs or heard one of his songs on the radio." "So it was horrible you know I woke up to the news thinking it might be a hoax because you never know what the internet's like. But then I switched on the morning news and there it was confirmed by his son Duncan. I was actually lost for words for quite a while. Which is unheard of and I'll be honest I think I spent more time doing press that day. By the way not instigated by me. Just by people getting in touch going we need a comment. I think I did more press on the Bowie thing than I've done on any given day for the new record. That's how much he meant worldwide to everybody else." "You know I mean I think it's the record that we've been trying to make for quite a while. And a lot of that is not down to effort. It's just down to good timing and good fortune and you know all the stars being in alignment. We don't work any harder or any less hard on any one given album. You put the same amount of shift in whether it be Hysteria or the new album." "We went ahead to just write some songs for our own amusement and our own kind of ego I suppose. And we started writing and those three songs that we were trying to write turned into 12. With the following writing session that turned into 14 and then when it was which three do we pick?. It was well why do we have to pick three?. And then that's when we realised we had an album. And all the influences of our entire lives were allowed to shine through on this record. Nobody ever formed a band having not heard another band because they'd have nothing to play. The fact is that over a years you develop your own style and then you kind of tend to stick to it."